The first consists of a walking tour of Summit Avenue and a tour of the James J. Hill House. Summit Avenue, named one of America's "Great Streets" in 2008, is lined with Gilded-Age mansions lived in by St. Paul’s past (and present) elite. This tour, led by Minnesota Historical Society staff, will examine the architecture, social history and current preservation issues of the historic neighborhood. The tour covers 1.5 miles, and all areas are handicapped accessible, although some side streets are cobblestone and have historic stone curbs. As part of this tour, the James J. Hill House will also be toured. The Hill House, completed in 1891 was the largest and most expansive home in Minnesota at the time. The building was constructed out of red sandstone by James J. Hill, the railroad magnate. Hill died in 1916 at which time he had amassed a fortune worth $63 million dollars and was one the wealthiest most powerful men of his time. The bus will depart form the hotel at 1:00pm and return at 5:00pm. This tour involves a significant amount of walking, so plan accordingly; wear comfortable shoes and bring water! This walking tour will take you through the heart of St. Paul’s theater district and through the Historic Landmark Center. This tour will familiarize guests with the area immediately around the St. Paul Hotel  literally within the “Heart of the City.” The tour will visit St. Paul’s historic and iconic destinations such as Mickey’s Diner, Candyland and the Hamm Building built in 1915. In addition to touring the heart of the city, guests will also tour the historic Landmark Center, built in 1902. This beautiful building originally served as the Federal Court House and Post Office for the Upper Midwest. During its tenure as the Federal Court House, the building was stage for the trials of some of the country’s most notorious criminals, including John Dillinger, “Ma” Barker, Alvin “Creepy” Karpis, and Evelyn Freschette. This walking tour will leave from the Landmark Center, located across the street from The St. Paul Hotel, at 2:00 and return at 4:00. This tour involves a significant amount of walking, so plan accordingly; wear comfortable shoes and bring water! This tour will visit the original steam plant built by Henry Ford in 1925 at his St. Paul facility. Located next to the Mississippi River, the steam plant was constructed to supply power and heat to the main St. Paul Ford facility. Although the plant is currently not operating, the building remains intact and much of the machinery remains in place. Buses for the Ford Steam Plant tour will depart from the hotel at 1:00pm and return at 3:30pm. This tour involves a significant number of stairs, many of which are fairly narrow and steep. 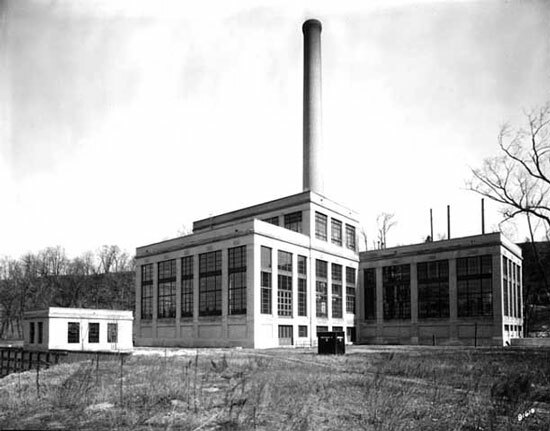 The steam generating plant at the Ford Twin Cities Assembly Plant, photographed in 1930. District Energy is located two blocks from the hotel, and provides heating, cooling and power to businesses and homes in St. Paul though a variety of sources. During the hour-long tour, visitors will see a presentation, the control room, wood loading area, thermal storage tank, wood boiler, and combined heat and power facilities, specifically the turbine/generator room. This walking tour will depart from the hotel at 12:15 and return at 1:45. Visitors must be over 18 and wear closed toe, flat shoes and long pants. Photography is allowed, but filming is not. 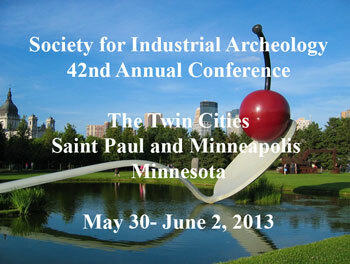 The New member’s reception is intended to welcome SIA members attending their first conference. This reception will take place at 317 on Rice Park, located one block from the St. Paul Hotel. Thursday evening’s welcome reception will take place at 317 on Rice Park. The reception will include a talk by renowned architectural historian and author Larry Millett. The 317 was built in 1914-15 for the Minnesota Club which was formed in 1869. 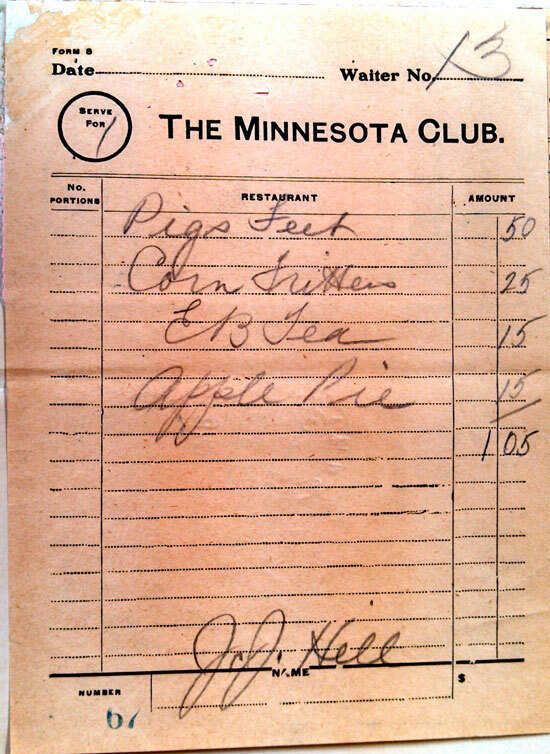 James J. Hill was one of the founding members of the Minnesota Club and frequently had lunch at the club. Some of his favorites were pig’s feet, corned beef or tripe with fresh asparagus, new peas and lyonaisse potatoes, and a piece of apple pie (Frame 1988:28). The building was refurbished in 2000 and is located one block away - across Rice Park - from the St. Paul Hotel.